It is remarkable that very heterogeneous migrants like waders from Patagonia or North American songbirds occur. Another focus of the studies – which are partially funded e.g. by the Brehm-Fonds – should provide data concerning rare and endangered bird species. According to the international criteria of the International Union for the Conservation of Nature (IUCN), 28 species are considered endangered, including e.g. Chestnut-bellied Guan (Penelope ochrogaster), Crowned Eagle (Harpyhaliaetus coronatus) or Blue-eyed Ground-Dove (Columbina cyanopis). 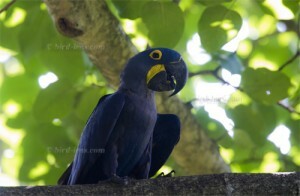 A prime example of a species with a very limited area of distribution almost exclusively restricted to the Pantanal is the endangered Hyacinth Macaw (Anodorhynchus hyacinthinus). At the end of the last century the population was on the brick of extinction. Now the total size of the population has grown to approximately 5,000 individuals in the core area. Nevertheless the Pantanal ecosystem is under great pressure by human intervention. Supposing a massive lowering of the water level in the coming decades due to massive water consumption by industries and households it is to be expected that today’s species-rich wetland countries transform large areas in arid areas with only a few generalist species. Projects for the protection of animal and plant life have therefore a top priority to match the loss of biodiversity. At the invitation of the Brazilian National Wetland Institute (INAU), scientist from all over the world are working in an international collaborative project of the University of Cuiaba to monitor the zoological diversity of the Pantanal and pursue ornithological studies on the biology and distribution of water and migratory birds. In the focus of the proposed project by 2014 is the collection of data on the occurrence and distribution patterns of bird species in the northern Pantanal using traditional and novel monitoring methods. One of the traditional means is to monitor birds by camera. The monitoring with the camera was very successful. During the 3 weeks stay, 193 species of birds could be observed – and photographed – at the Pousada Pouso Alegre and in total 207 species of birds could be observed in northern Pantanal in total. Here you see some birds in the gallery. The parrots you will find here. And of course the hummingbirds you find in the gallery, too. Some birds in flight got their own gallery-site. Bird-lens is mainly a website to suit the growing demand for top shots of the species of the Western Palearctic. But of interest is the phenomenon of bird migration in general. Trips to tourist and non-tourist spots like Thailand or the Seychelles to capture images of rare migrating birds are part of the program and were already very successful. More nice images you find in the gallery or in the “Pictures Shop”. Just give me a message, if Bird-lens could serve you with images also outside the range of the Western Palearctic. Images of e.g. South America are well on stock, too. Previous PostSpoon-billed Sandpipers and other waders in Thailand on wintering groundsNext PostInflux of Hawk Owls (Surnia ulula) cancelled?